my bare cupboard: Chicken chow mein "
When you look at the photo above , do you see a dark and/or moody shot ? To me , it kinda look perky , maybe too much color ? Too bright ? Need to practice ! Or get Lightroom ! Ha ! Who needs it when Picmonkey is free ? Anyway , aside from my love-hate relationship with rice , noodles is another favorite of mine . This week alone , I've cooked 3 noodle dish ! I found out last time when I cooked this noodles that it tastes so much better the day after . I've got some leftover of this and the next day , I steamed it for lunch , don't use microwave , please ?! , and I like it more compare when it was freshly-cooked , maybe because all those flavors had time to blend together . Marinate chicken with 1/2 tsp chicken powder , 1/2 soy sauce , 1 tsp five-spice powder , few drops of sesame oil . Add 1 tsp tapioca starch or cornstarch before frying . For the sauce : In a small bowl , combine together 1/3 cup water , 1 teaspoon light soy sauce , 1/2 tsp dark soy sauce , 1 tsp oyster sauce , 1 tsp brown sugar and 1 tsp chili sauce . * Boil noodles for 3 minutes , drain then sprinkle few drops of sesame oil to prevent noodles from sticking . 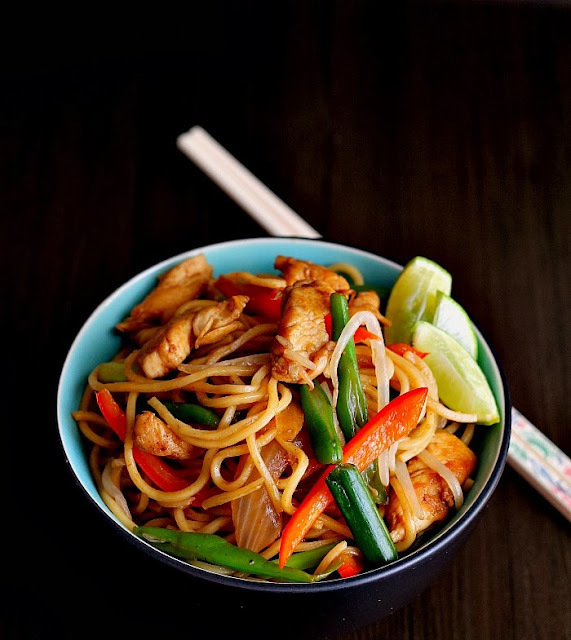 * Meanwhile , heat a wok or a large pan , pour in 1 tablespoon of oil , add in the garlic and ginger , stir fry until fragrant then add in the chicken pieces , cook for 3 minutes or until golden brown . Transfer to a plate , keep warm . In the same pan , add in onion , stir fry until softens , add in the beans and the bell pepper , cook for 1 minute . Add the chicken , noodles and beansprouts , stir well to combine , pour in the sauce , mix well and adjust taste . Add in spring onion and drizzle the lime juice , give it another good stir and serve warm . the shots are perfect, like from a good book! Anne, I love chow mein and never get tired eating everyday. Yours looks very delicious! I love noodles, the instant packeted kind hehe! that's cause I always find it a chore to cook from scratch even though it's just throwing in ingredients and stir frying, like so simple huh! :D More washing up to do lol! Love the moody photo, looks good. 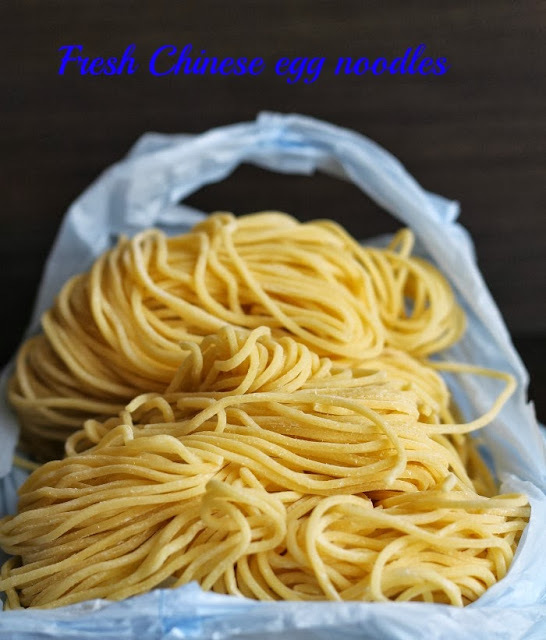 Delicious plate of noodles! Yum, this makes a wonderful lunch, simple and delicious! I cook noodles a few times a month too! And I agree with you, do not use the microwave to reheat, steam is the best, goes with leftover rice too! 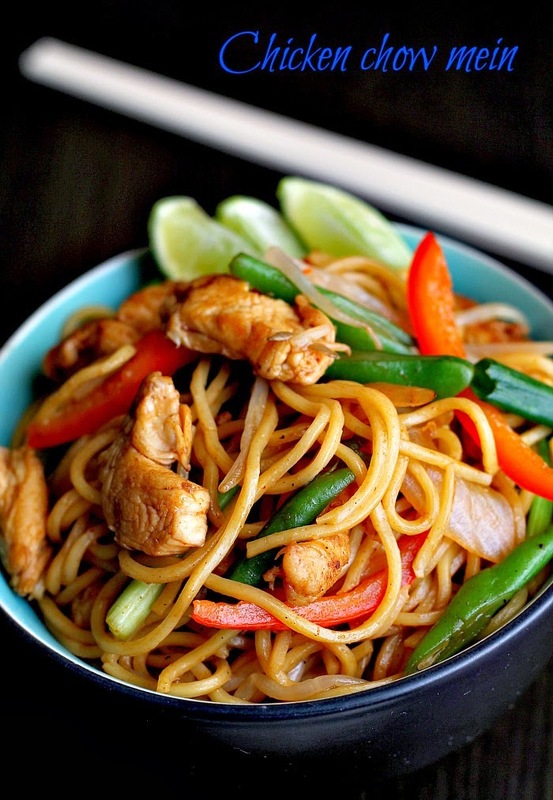 This chicken chow mein looks fantastic!! I love chow mein, but have never made it at home before. But I REALLY want to!! Love this easy dish... great for days when you have no time to spend in the kitchen! Suchi , will check it out ! Hi Anne, I agreed with Alvin, when I first see your photo, it give me a Wow feel, like this type of dark photo, and with that bowl of colourful noodles, I wish I can take a bowl from the screen, hehehe..nice shots girl! I am not good at photography but the noodle bowl does look delicious. Only just noticed as I am attempting to make tonight.